If you have an older metric, Honda, Yamaha, Suzuki, Kawasaki or Triumph or BSA, we also offer these bars in 7/8". Please see our other listings for your application! If you do not have a springer front end, please see our other listing. We have these listed for fork tube type front ends. IT IS UP TO YOU TO MAKE SURE YOU ORDER THE CORRECT BARS! We also offer these bars in different sizes! See our other listings! If you need something custom made, let us know, we will be glad to help! Bottom tube width is 9.5"
What are knurls? Knurls are a swelled diamond cut pattern on the bottom tube where the bars clamp onto your bike, that keeps them from rotating under exceleration. THIS IS A MUST ON APE HANGERS! Beware of tall handle bars offered without knurls! Our bars WILL NOT slip or rotate in your clamps! If you DO NOT have a Springer, please see our other listings. Springers take a different knurling spacing. We have them available for regular fork tube type front ends. All of our 1" bars are ready for internal wiring. We machine the grooves in the bars to work with your factory controls! Your Factory Harley switch housing must be used on "dimples" bars, or there is no way for the switch wiring to exit the switch housings. Our 1" bars are made to work with either internal or external wiring! If you buy a set of bars that are not dimpled, you will be disappointed. For those of you using custom controls where no wiring on the bars is required.... we CAN make you a set with no dimpling upon request. We are not going to charge you $300 or $400 for a set of handle bars. Our bars are just as high of quality, and come with more for your money. With our bars you get the knurling for FREE. Drilled and dimpled for FREE. And the capability of running the wires internal FOR FREE. And they are BEAUTIFULLY tig welded right here in the great U.S.A! 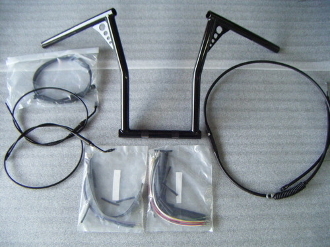 Cable kit includes extended single brake line, clutch cable, throttle & idle cables, and wire extension harness.